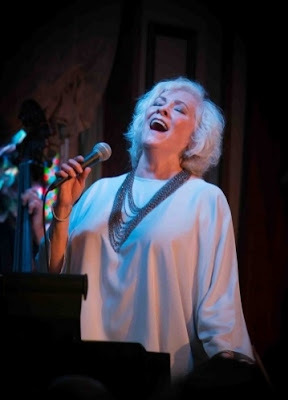 For the last four years or so, Karigee and I have looked forward to October (and sometimes February) in New York City more than any other month because it would mean the return of Betty Buckley at Feinstein's. This October came too slowly and then went way too quickly and took Betty with it....and it was possibly the last time we'll see her there, at least for a very long time. Feinstein's at the Regency is closing its doors on December 31st due to renovations coming to the Regency. On top of the thrills that came with hearing Betty perform live in such a sophisticated, intimate venue, I had some of the best times of my life on those evenings. Some of my best friends came along for the various incarnations of her show: Karigee (natch! ), Robert "Ravinia Bob" Bullen (Chicago Theatre Addict), Kevin Daly (Theatre Aficionado at Large), Byrne Harrison (Stage Buzz), Roxie, Chelsea, and Steve and Doug. Between rather large bar tabs, sometimes hotel room bills and tickets for multiple repeat visits, we dropped some serious change at this joint. And let me tell you, it was worth every last red cent. Betty was at Feinstein's for the whole month of October with a new show "The Other Women: The Vixens of Broadway." She sang the songs of supporting female characters of musical theatre - all show stoppers and each stopping her own show. She opened with "When You're Good to Mama" - vamping around the room and selling it like nobody's business. As usual, Betty delivered the gamut of emotions - she makes me laugh and laugh and then she'll pierce my heart when she gets down to the emotional business. I was thrilled to hear her sing a really sultry rendition of one of my favorite songs from Rodgers and Hammerstein's Allegro, "The Gentleman is a Dope." She also gave us an especially gorgeous "Something Wonderful" from The King and I. The set also included "A Fact Can Be a Beautiful Thing" from Promises, Promises, "Another Suitcase In Another Hall" from Evita, "I Know Things Now" from Into the Woods and "The Miller's Son" from A Little Night Music. Betty had her band with her - Christian Jacobs on piano, who also did all of the arrangements, Tony Marino on Bass (incidentally Betty and he did one of the coolest skatting riffy things! ), Vic Juris on guitar and todd Isler on drums. Together with Betty, they give her sets an old school, jazzy sound - Betty gets to be the Girl Snger and the only thing missing is a dance floor. It's a delicious sound of which I'm absolutely mad. Until I can hear her live again, which I hope is sooner rather than later, and hopefully someday again at Feinstein's (and quite possibly across the pond when she stars in DEAR WORLD at the Charing Cross Theatre), I'll have to be satisified with Betty's albums, all of which I love. I'm particularly smitten with her latest: Ah Men! The Boys of Broadway which is beyond fabulous in repertoire and sound.